In 2010 Robert Young Pelton took his original 3? 1095 Shon Rowen-made fixed survival blade and turned it into a brutal use locking folder. He demanded the best, American made Ti aerospace grade titanium alloy and Olive Drab G10 to create an integral, no scale frame. Then he added a D2 Tool Steel blade, mil spec coated it and had it machined in Northern Italy the same place they make Ferraris, Lamborghinis and Ducatis. He added a hex driver, low profile clip and glass breaker. The knife also features the same bottle opener notch premiered on the fixed blade which, on a folder, doubles as a "quick open" feature. It continues to make experienced knife users rethink what they can get in a hand assembled, user designed, no excuses survival tool. But there is another group that want the same no expense spared approach to the under 3" inch blade. Law enforcement, military and first responders wanted less blade, more knife. And they still wanted the glass breaker, rapid deployment, non lethal ergonomic grip and quality. So the Hostile Environment At Hand Tool (HEAT) was born. 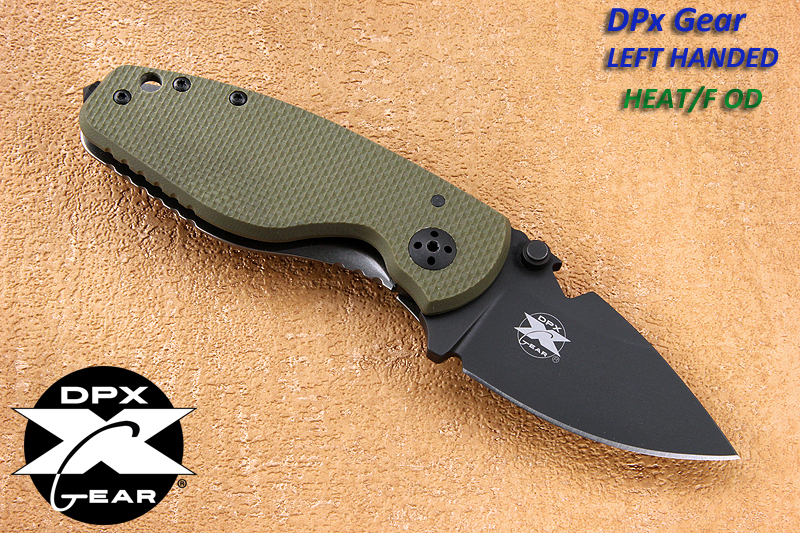 The DPx Gear HEAT/F is as much blade as you need, in a beefy, pocket friendly package. What?s different? They dropped the blade size but not the blade thickness leaving the business end of a sword grind that snaps quickly into action. They eliminated the hex drive slot and the aluminum back spacer but kept that confident, beefy feel that HEST/F folder owners love. Finally they backed it with the same no nonsense, no questions asked warranty that Robert Young Pelton demands. LIFETIME WARRANTY BY DPX GEAR INC.